Career-best figures for the left-armer prove futile as the Proteas miss out on a clean sweep in the T20 series. The T2o era has – at times – made cricket a cruel game for bowlers. 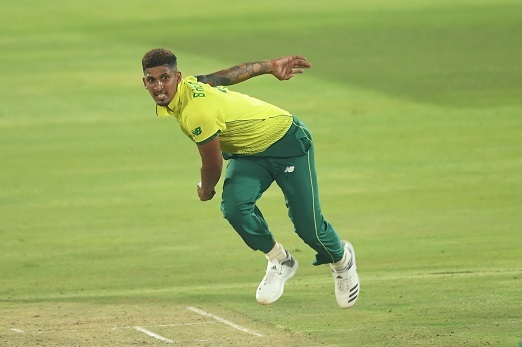 Beuran Hendricks though arguably had an even more frustrating experience – the one where a career-best bowling performance amounts to essentially nothing. Indeed, the left-arm seamer gained much plaudits for a superb spell of 4/14 from his four overs, but couldn’t prevent the Proteas from slumping to a 27-run loss to Pakistan in the third and final T20 in Centurion on Wednesday night. They nonetheless won the series 2-1. Hendricks truly was outstanding, varying his lengths and pace well in initially keeping the run taps dry and then being rewarded with wickets at the death. By all accounts his efforts should’ve left South Africa with a fairly undemanding target, yet Pakistan dragged themselves out of a hole through Shadab Khan (22 off 8), who smashed 21 runs off Andile Phehlukwayo’s last over, an assault that included three sixes. It was a deflating way for the homes side to end their effort with the ball after they’d recovered well from a poor start, with Babar Azam (23 off 11) taking a particular liking to Junior Dala. South Africa steadily eroded Pakistan’s resistance to have them 146/9 before Shadab hauled them to 168. Both openers, Reeza Hendricks and Janneman Malan, were dismissed within three overs, crippling the Proteas’ reply. Rassie van der Dussen (41 off 35),who hit two sumptuous sixes, gamely tried to hold things together, but lacked support and eventually succumbed to a full toss. With no realistic chance of victory, Chris Morris at least provided a packed crowd with some entertainment in ending with a maiden, unbeaten fifty as he smashed 55 off just 29 balls. A highlight was him hitting Faheem Ashraf for 21 runs in his third over. Mohammad Amir ending with fine figures of 3/27.